This morning when I woke up, I went on youtube and search videos with "korean skincare" titles. 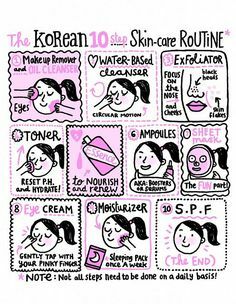 I found this "10 steps korean skincare routine" which I thought was pretty interesting. My skincare routine only involves foam cleaner, toner, moisturiser and sometimes mask + scrub. So I looked up products I would be likely buying to complete my routine and the total came up to around $160. Such a huge amount to be spent in one go, so I'm not going to buy them all at once and plus it's online shopping, I would have to pay more taxes. 10. Sun protection/bb cream with SPF or night cream - Tick for sunscreen and for night cream Etude House Moistfull Collagen Cream.